Portland was first with ranked-choice voting, legal pot and higher wages. 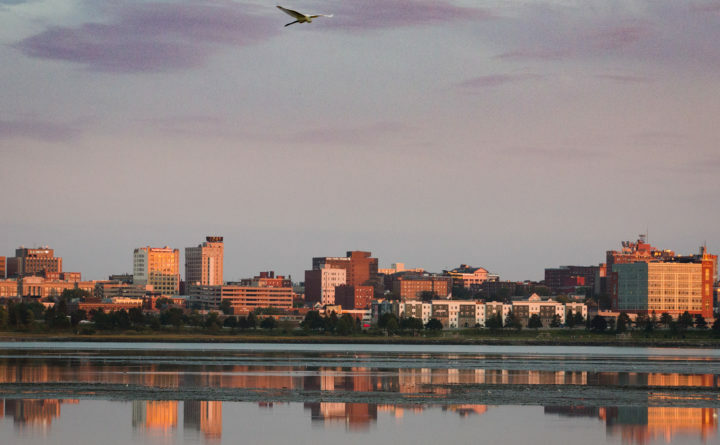 What will the city bring to Maine in 2019? The sun sets on the Portland skyline in this BDN file photo. Over the decades, the city of Portland has repeatedly been the first place in Maine to implement progressive programs and policies that would later pop up in other communities — and in many cases, go statewide. The city was the first with a non-discrimination law focused on sexual orientation when it passed one in 1992, for instance, and was the first to outlaw smoking in restaurants when it did so in 1999. Statewide laws ultimately followed in both cases. In much more recent years, Portland brought ranked-choice voting to Maine when it used the new method in its 2011 mayoral election, legalized recreational use of marijuana in 2013, took action to reduce the use of plastic shopping bags in 2015 and raised the minimum wage in 2016. All of those initiatives, in some form, have subsequently either spread to other municipalities or have been implemented by the state or both. While Portland’s political climate is decidedly left of most anywhere else in Maine, it has also become something of a bellwether for the state. Mayor Ethan Strimling speaks to reporters after giving his State of the City address in Portland in this 2017 BDN file photo. “Once they’re put in place at the local level and everyone sees that not only does the sky not fall, but it actually works really well, other communities see that and follow suit,” said Portland Mayor Ethan Strimling. So what are some of the things Portland might bring to Maine in 2019? Here’s are the next progressive initiatives on the city’s to-do list. Strimling and local workers’ groups have pushed for an ordinance that would require employers in Portland to offer paid sick leave. Under their initial proposal, workers in the city would accrue one hour of paid sick time for every 30 hours they spend on the job, up to a maximum of 48 hours a year. The provision would apply to both full- and part-time employees, but would not affect employers that already offer this amount of sick time. Supporters say the plan would provide benefits to about 19,000 workers in the city, according to the Portland Press Herald, but could also add nearly $400,000 to the city budget, as Portland would need to consider launching a new municipal Department of Labor to oversee enforcement of this and other workplace-related ordinances. The mayor said the City Council to may be considering this ordinance as soon as the first quarter of 2019. The next question is: How likely is it that the rest of the state might follow suit? Well, Sen. Rebecca Millett, D-South Portland, is already championing the cause in the Legislature. Millett has said 10 other states — including four in New England — already require it, so a statewide law would have some precedent elsewhere. However, in both Portland and Augusta, the proposal has seen opposition. Business and hospitality advocates have decried the plan as another government mandate and cost that makes it harder to stay afloat here. The Portland Regional Chamber of Commerce has come out against the ordinance, saying in a statement that the organization supports offering paid sick time, but worries that a one-size-fits-all mandate wouldn’t work, and that because unemployment is already so low, market forces apply enough pressure on businesses to provide attractive benefits to workers. Maine already requires contractors working on state contracts above $50,000 to pay prevailing wages, industry averages which range from $12 per hour for flaggers at road work sites to almost $82 per hour in pay and benefits for elevator installers. However, that rule only applies when the state is managing the project — if the state just pays for a project and a municipality administers it, contractors no longer have to offer prevailing wages. Portland in 2017 was the first community to pass a rule requiring any project in the city benefiting from a certain tax break program to offer prevailing wages. Now Strimling said the city is considering expanding the requirement to any contractor working on a municipal project, closing the loophole in the state law, at least locally. Pious Ali greets voters at the Grace Baptist Church on Summit Street in Portland in this BDN file photo. 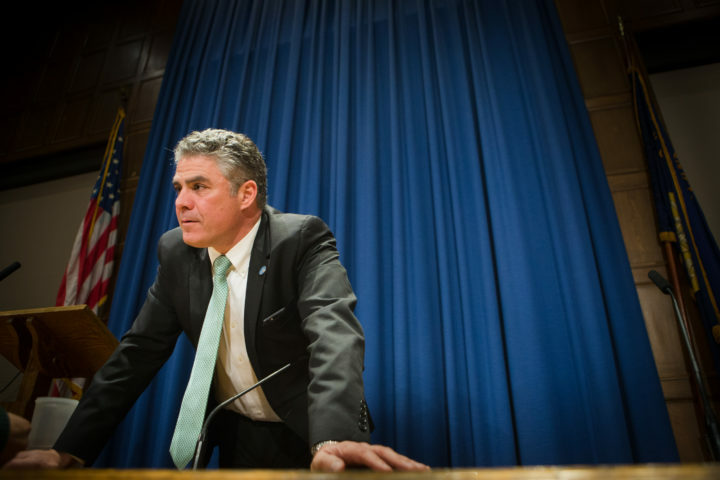 During debate over the tax break requirement, Strimling and Councilor Pious Ali wanted to include a provision forcing developers to also offer apprenticeship programs, according to the Press Herald, but the idea didn’t garner enough support among the rest of the councilors to make it into the ordinance. That provision may come back in play as the City Council considers the new “responsible contracting” proposal in early 2019. This one may not be the political lightning rod that other Portland initiatives over the years have been, and its spread around Maine may be quieter. Other communities in Greater Portland could add similar requirements and Strimling said he hopes Maine will soon consider closing the loophole at the state level. This proposal may be the longest shot to find traction beyond city limits. A referendum on whether to allow noncitizens living here legally to vote in local elections almost appeared on the November ballot in Portland. But in August, the City Council abruptly sent the proposal down to a subcommittee for more review instead, after hearing concerns from immigrant advocates that it could backfire and confuse new arrivals who may think they can vote when they can’t. Ali said at the time he wants to work with his fellow councilors to resolve those problems with the proposal “as fast as possible,” which could mean Portland voters see the referendum as soon as the June election — November, if not. Noncitizen voting was widespread in the United States in the 18th and 19th centuries and several municipalities — mostly in Maryland — allow it in some form or another today. So if Portland takes this step, it wouldn’t be setting any historic precedents. But it is unclear whether noncitizen voting is legal in Maine and state Republican leaders have already voiced opposition. If Portland eventually did extend the vote, it may need to persuade a court that the measure is permissible in the state, or convince lawmakers of both parties and the governor to change it, an effort that was rejected in 2009.